I wanted to design a new type of Filtertron looking pickup, still with the same bright attack but with a lower output for a more wiry, more brittle, more 'steel string' sound and after many, many prototypes they're here - introducing the Black Cat 'Spaghetti Western' pickups for Gretsch & Cabronita style guitars. I didn't want to just make slight modifications to the classic Filtertron spec, wanting to make something a little different, a little more unique. The idea of having 12 individual, adjustable magnets would allow you the 'dial in' each string, akin to each string having its own EQ, and unlike the classic Filterton design, I wanted much more clarity, much more definition. The geometry of the slimmer 'No Ears' mount Filtertron size & style meant a new approach had to be taken with the magents. The usual threaded magnets I have made for me Wide Range Humbuckers and Sonic-Six pickups were just too fat, too wide a diameter so I've had a new custom size threaded rod magnet manufactured uniwue to this new pickup design. The Individual threaded magnets and custom, offset coils help give the new 'Spaghetti Western' pickups a unique wiry, attacking, brittle bridge sound that really cuts through the mix without being too bright or shrill, a clear, crunchy middle position and a sweet, rich, defined neck sound. These are a direct drop-in replacement for the standard 'No Ears' mount Gretsch & Cabronita pickups and I can provide them with mounting screws for Gretsch style guitars or direct-to-body mounting screws for Cabronita guitars. Currently available with chrome covers included. 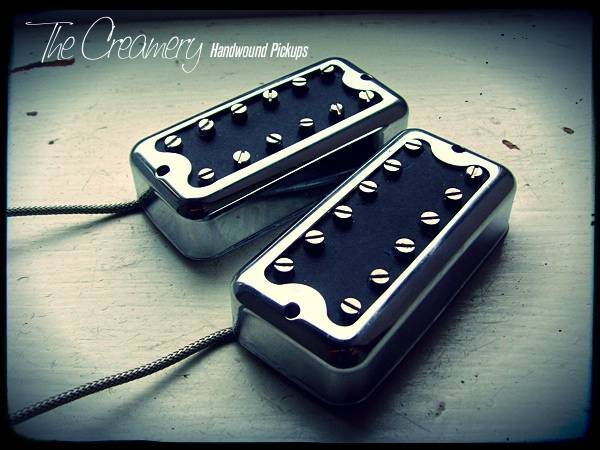 You can find more details of my Creamery Custom, Handwound Black Cat Filtertron Design Pickups here.